1998 Monarch 10” x 20” Lathe s/n 38925-R w/ Acu-Rite DRO, 25-4000 RPM, Inch Threading, Metric Change Gears, Taper Attachment, Tailstock, 5C Collet Closer, 8” 6-Jaw Chuck, 8” 3-Jaw Chuck, 8” 4-Jaw Chuck, 6” 3-Jaw Chuck, 6” 4-Jaw Chuck, Aloris Tool Post, Monarch Tooling Cabinet. Airco Temescal mdl. 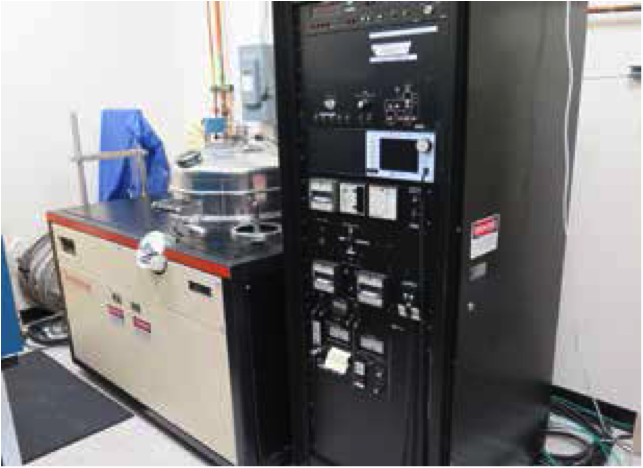 FC-1800 Electron Beam Evaporator s/n 260 w/ Infinicon SQC-310 Disposition Controller, Mdl. CV-8 High Voltage Controller, Automatic Penetration Controller, Proportional Substrate Heat Controls. Denton mdl. DV-502A Turbo Auto High Volume Thermal Evaporator s/n 23823 w/ 12” x 18” Bell Jar, AC Glow Discharge, Manual Bell Jar Lift, Leybold XTC/2, Turbo Vacuum Pump, Omni-Rotary Fixture, 2kVa Evaporation Power Supply. 2000 SpeedFam-IPEC mdl. 9B-5L Double-Sided Lapping Machine s/n 9B-5L 2365115-744 w/ SpeedFam PLC Controls, Sony DRO, Pneumatic Bridge Control, Cole-Parmer MasterFlex Slurry Feed Drive, (5) Rotating Plates. P.R.Hoffmman mdl. PR-1 66T Double-Sided Lapping Machine s/n 2132 w/ Auto Sizing Controls, Slurry Feed Unit, Pumps and Timers. Labconco “Paramount” Ductless Laboratory Fume Hood w/Digital Controls. AirTech mdl. LB#1 Laboratory Fume Hood (50 Hz System). Yuasa 5” 3-Jaw / 5C Compound Indexing Fixture. Mitutoyo mdl. 986-121 Precision Sine Vise. Mitutoyo mdl. 986-101 Precision Vise. (40)5C Collets and Step Chucks.